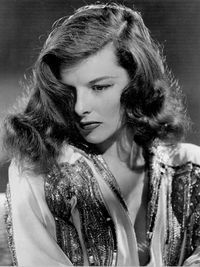 Katharine Houghton Hepburn, sometimes known as Kate Hepburn (May 12, 1907 – June 29, 2003), was a four-time Oscar-winning actress. Home-schooled in Connecticut for much of her teen years, she later attended Bryn Mawr College, on of the "Seven Sisters" institutions located to the west of Philadelphia, Pennsylvania, at which developed an interest in acting. She first appeared on radio and then in many film roles, including nine with co-star, Spencer Bonaventure Tracy (1900-1967), with whom she had a romantic relationship from 1941 until his death. Hepburn is also remembered for her co-starring roles with John Wayne in the 1975 film Rooster Cogburn and the 1981 picture about an aging couple, On Golden Pond, with Henry Fonda. This page was last modified on 26 September 2018, at 12:57.